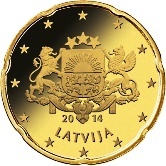 Latvia, together with Andorra, joined the Eurozone in 2014. 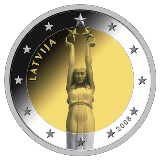 Some basic facts relating to Latvia. 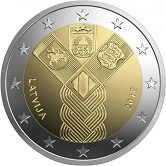 The Latvian Euro Coins have some very attractive motifs and the commemorative series on the regions is particularly interesting. 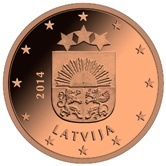 A small Latvian Coat of Arms for the 1 cent , 2 cent and 5 cent coins. A large Latvian Coat of Arms for the 10 cent, 20 cent and 50 cent coins. 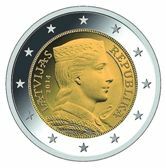 The head of a Latvian woman in the national costume for the 1 Euro and 2 Euro coins. 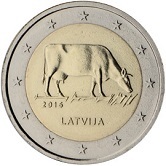 The original design for the 2 € coin featured the Latvian "Freedom Statue" holding aloft three stars symbolising the unity of three Latvian provinces. 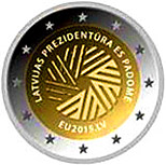 This was not allowed however, as it clashed with the concept of the outer 12 stars representing solely the unity of Europe. 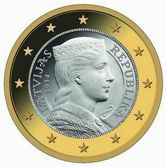 What a pity-I think it would have been a very attractive 2€ coin! 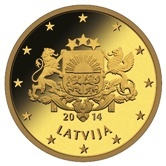 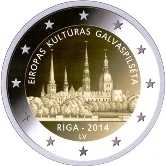 Latvian Commemorative Two Euro Coins. 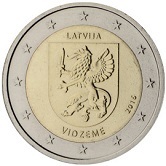 Issuing Volume : 1 Million. 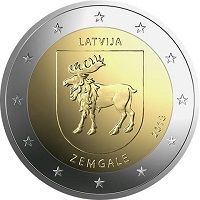 2018 - The Latvian Province - Zemgale. Return from Latvian Euro Coins to Links to Specific Countries. 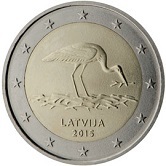 Return from Latvian Euro Coins to euro coin collector.